In modern vehicles, the technology you'll find inside is just as important as the technology under the hood. The 2018 Ford Edge has all the flashy equipment you would ever need to stay connected, informed, and entertained. The popular mid-sized vehicle is built with features that can benefit you on your daily commute and family road trips alike. When you step inside the Edge, you'll see a bright touchscreen display positioned front and center. There are a few different size options available based on the configuration that you choose. All systems use a responsive touchscreen and have the SYNC 3 system built right in. You can connect your mobile device to use everything from navigational programs, streaming services, and review applications. 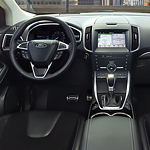 To see how the unique infotainment center of the 2018 Ford Edge looks in person, stop by Hebert's Town & Country Ford Lincoln today. We'll show you the entire lineup and put you in the driver's seat for a test drive.